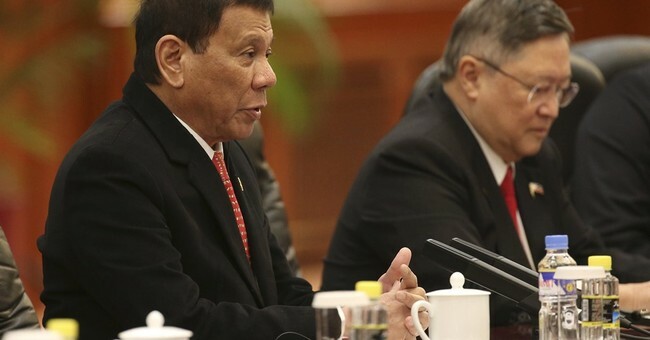 Philippine President Rodrigo Duterte has made some controversial remarks in recent weeks. In September, he called President Obama a "son of a whore." He then raised eyebrows when he said the Phillippines would not be taking part in military drills with the U.S. earlier this month. In Beijing, China on Thursday, he said matter-of-factly that he is cutting off military and economic ties to the United States. "America has lost now. I've realigned myself in your ideological flow," he told business leaders in Beijing on Thursday. "And maybe I will also go to Russia to talk to Putin and tell him that there are three of us against the world: China, Philippines and Russia. It's the only way." After these biting remarks, the Obama administration immediately responded. They have not received any such requests from Duterte, Deputy White House Press Secretary Eric Schultz told reporters on Thursday. Now, Duterte is walking back his comments. He claims he did not mean total separation from the U.S. He just wants a more independent foreign policy so the Phillippines can pursue a stronger relationship with China. He cannot cut economic ties to America, he ensured the press. "It is not severance of ties. When you say severance of ties, you cut diplomatic relations. I cannot do that," the Philippine leader told reporters at a midnight news conference in his southern home city of Davao. "It's in the best interest of my countrymen to maintain that relationship."